THE BABY THEATER 2D ultrasounds can start as early as 16 weeks gestation and continue to term. 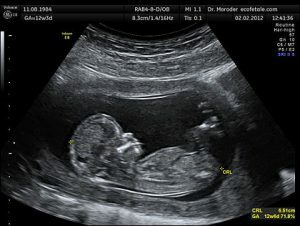 We can usually determine gender at 16 weeks during a 2D sonogram. This is a great time to see the baby kick and turn. A 2D ultrasound provides images of your baby through sound waves. The Baby Theater requests that all expectant mothers that come in for a 2D ultrasound have a full bladder. The optimal time to come in for a 2D Ultrasound is 16 plus weeks. A 3D ultrasound can be obtained at any time during pregnancy, however the optimal time to have a 3D Ultrasound is between 26 and 32 weeks. Earlier pregnancy ultrasounds allow mothers to see more complete images of their baby. Later 3D baby ultrasounds reveal improved facial features since the developing fat layer enhances these images. It is important to remember that all images are dependent on the baby’s position, movement, size, and the amount of surrounding amniotic fluid. Be sure and check out our Ultrasound Calculator to schedule an appointment at the optimal time. A 4D Ultrasound (or 4D Live Motion Imaging) is the continuous three-dimensional scanning of the baby with a simultaneous visualization of the A, B, and C planes. This revolutionary quad-beam technology, which obtains 3D images in Real-Time up to 25 volumes per second, goes beyond the boundaries of traditional ultrasound and opens the 4th dimension of Real Time so that you can see your baby moving in 3D.